You’ve heard about self-driving cars, but what about autonomous ships? Fortune Tech reports that the world’s first autonomous cargo ship, to be christened the Yara Birkeland is expected to start sailing in 2018, initially delivering fertilizer along a 37-mile route in southern Norway. Analysis by Allianz Global Corporate & Specialty (AGCS) shows that human error accounts for approximately 75 percent of the value of almost 15,000 marine liability insurance claims studied over five years, equivalent to over $1.6 billion. 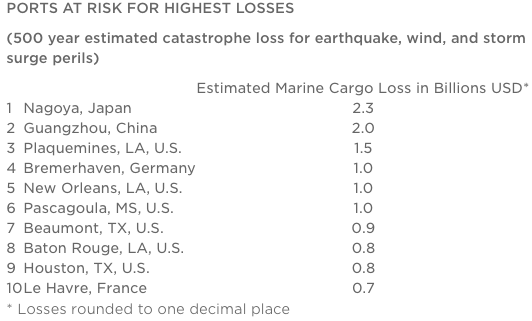 Check out Insurance Information Institute facts & statistics on marine accidents. A protracted labor dispute that continues to disrupt operations at U.S. West coast ports underscores the supply chain risk facing global businesses. Disruptions have steadily worsened since October, culminating in a partial shutdown of all 29 West coast ports over the holiday weekend. The Wall Street Journal reports that operations to load and unload cargo vessels resumed Tuesday as Labor Secretary Tom Perez met with both sides in the labor dispute in an attempt to broker a settlement amid growing concerns over the impact on the economy. More than 40 percent of all cargo shipped into the U.S. comes through these ports, so the dispute has potential knock on effects for many businesses. A number of companies have already taken steps to mitigate the supply chain threat, according to reports. For example, Japanese car manufacturer Honda Motor Co, among others, has been using air freighters to transport some key parts from Asia to their U.S. factories — at significant extra expense. On Sunday Honda also said it would have to slow production for a week at U.S.-based plants in Ohio, Indiana, and Ontario, Canada, as parts it ships from Asia have been held up by the dispute. Toyota Motor Corp. has also reduced overtime at some U.S. manufacturing plants as a result of the dispute. A brief published by Marsh last year noted that a West Coast port strike or shutdown could have broad consequences for global trade, business and economic conditions. Organizations with effective risk management and insurance strategies in place will be best prepared to manage and respond to situations that hamper their flow of goods and finances, Marsh noted. In 2002, a similar labor dispute ultimately led to the shutdown of ports along the West coast costing the U.S. economy around $1 billion each day, and creating a backlog that took six months to clear. Many businesses purchase marine cargo insurance to protect against physical loss or damage to cargo during transit. This type of insurance generally will not respond in the event that a strike or other disruption at a port delays the arrival of insured cargo, unless there is actual physical damage to the cargo, according to Marsh. However, some policyholders may have obtained endorsements to their insurance policies, or purchased additional coverage to protect themselves from the effects of port disruption. Trade disruption insurance (TDI), supply chain insurance, and specialty business interruption insurance may also provide coverage for the financial consequences of a port disruption, Marsh wrote. A study by FM Global of more than 600 financial executives found that supply chain risk, more than any other, was regarded as having the greatest potential to disrupt their top revenue driver. FM Global’s Resilience Index can help executives evaluate and manage supply chain risk. WeÃ¢â‚¬â„¢re visiting the United Kingdom this week, so itÃ¢â‚¬â„¢s appropriate we bring you a British themed news item. An unpublished and original insurance claim for the loss of the Titanic will come under the hammer this Saturday at AldridgeÃ¢â‚¬â„¢s auction house in Devizes, Wiltshire. The document is expected to fetch more than Ã‚ £12,000 ($20,185). ItÃ¢â‚¬â„¢sÃ‚ more thanÃ‚ 100 years since the RMS Titanic, a luxury British passenger liner, sank in the North Atlantic ocean on April 15, 1912 after colliding with an iceberg during her maiden voyage from Southampton, UK to New York City. She carried 2,224 passengers and crew, but had lifeboats for only 1,178 people. More than 1,500 people died in the disaster. The 4-page insurance document up for sale was prepared for insurance purposes and written by second officer Charles Lightoller, the most senior officer to survive the Titanic disaster. It was certified and signed by the TitanicÃ¢â‚¬â„¢s second, third, fourth and fifth officers on April 19, 1912. In the words of the auctioneers, itÃ¢â‚¬â„¢s fascinating that the officers would seem to attempt to minimize their encounter with the rather large and ominous iceberg by describing it as a Ã¢â‚¬Å“small low-lying iceberg.Ã¢â‚¬  This could possibly have been an attempt to downplay the size of the iceberg due to the question of liability and who was to blame for the sinking. As the Western Daily Press reports, the strategy worked. Insurers paid out Ã‚ £3 million ($5.1 million) within 30 days Ã¢â‚¬“ crucially before a major inquiry revealed the catalogue of mishaps that led to the sinking. The lot is one of 200 Titanic collectables included in the auction, which is to commemorate the 102nd anniversary of the loss of the ship. 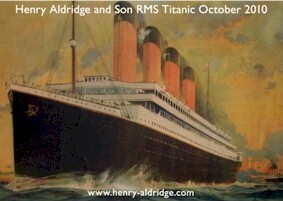 Atlantic Mutual, then the largest marine and general insurance firm in North America, was one of the major insurers of Titanic, providing the Oceanic Steam Navigation Co, Ltd (TitanicÃ¢â‚¬â„¢s parent company) with what is believed to be more coverage for the ship than any of the many other single carriers which were part of TitanicÃ¢â‚¬â„¢s insurance consortium. Numerous LloydÃ¢â‚¬â„¢s syndicates put their names on the insurance slip to cover the Titanic which was considered a prestigious risk to insure. More on how the disaster remains strongly linked to the history of the LloydÃ¢â‚¬â„¢s market here. The insurance policy was sold in an October 2013 auction. Piracy on the worldÃ¢â‚¬â„¢s seas has reached a five-year low, with 297 ships attacked in 2012, compared with 439 in 2011, the International Chamber of Commerce (ICC) International Maritime Bureau (IMB) global piracy report revealed today. WorldwideÃ‚ numbersÃ‚ fellÃ‚ thanks to a huge reduction in Somali piracy, though East and West Africa remain the worst hit areas, with 150 attacks in 2012, according to the IMB report. Globally, 174 ships were boarded by pirates last year, while 28 were hijacked and 28 were fired upon. IMBÃ¢â‚¬â„¢s Piracy Reporting Centre also recorded 67 attempted attacks. The number of people taken hostage onboard fell to 585 from 802 in 2011, while a further 26 were kidnapped for ransom in Nigeria. Six crewmembers were killed and 32 were injured or assaulted. In Somalia and the Gulf of Aden, just 75 ships reported attacks in 2012 compared with 237 in 2011, accounting for 25% of incidents worldwide. The number of Somali hijackings was halved from 28 in 2011 to 14 last year. IMB says navies are deterring piracy off AfricaÃ¢â‚¬â„¢s east coast, with pre-emptive strikes and robust action against mother ships. So too are private armed security teams and crewsÃ¢â‚¬â„¢ application of Ã¢â‚¬Å“Best Management PracticesÃ¢â‚¬ . Follow the IMB record of piracy and armed robbery incidents on Twitter and view latest attacks on the IMB Live Piracy Map. The Washington Post has more on this story. The marine insurance industry is facing a bleak present as it seems to be unable to adapt to a changing business environment amid ongoing economic uncertainty, an international gathering of marine insurers was told. In a keynote addressÃ‚ to the annual conference of the International Union of Marine Insurers (IUMI) in San Diego, IUMI president Ole Wikborg noted that some marine underwriting entities Ã¢â‚¬“ both old and new Ã¢â‚¬“ were facing downgrades, and even closures, as a result of prevailing economic uncertainty. This lack of innovation may be a result of marine insurersÃ¢â‚¬â„¢ inability to renew a business model that is out of touch with the needs and requirements of the client base, Wikborg said. He went on to suggest that the marine insurance industry may be unable to build and maintain a sustainable business activity through continuous profitmaking and service delivery because underwriters are disobeying the undeniable truths of their past performance.